Not really one to start posting recipes and things I’ve made, but the meal I cooked last night was particularly delicious and therefore, I think, worth sharing. It was Lemon Sole with Salsa Verde and steamed Samphire. 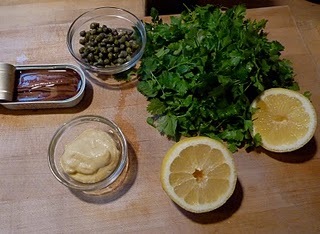 The salsa verde was very satisfying indeed – to both make and eat.